sometimes cited also as Frýdlant v Čechách is a town in the Liberec District of the Liberec Region in the Czech Republic. It has approximately 7,500 inhabitants and lies in the historic Bohemia region on the outskirts of the Jizera Mountains. The area once belonged to the Lordship of Zawidów (Seidenberg) in Upper Lusatia, held by the Bishops of Meissen. The town was first mentioned in 1278, when the Bieberstein noble family was enfeoffed with Friedland-Seidenberg by King Ottokar II of Bohemia and took their residence at Frýdlant Castle. Upon the extinction of the line in 1551, the lordship fell to the House of Redern.Meanwhile the Kingdom of Bohemia had become a part of the Habsburg Monarchy. Christoph von Redern opposed Emperor Ferdinand II during the Counter-Reformation and after the Defenestration of Prague was among the uprising Bohemian Protestant estates, who were defeated at the 1620 Battle of White Mountain. Redern saved his life, but his lands were seized by the Emperor and given in reward to his General Albrecht von Wallenstein, who titled himself "Duke of Friedland" and took his residence at Jičín. The nominal sovereignty of Friedland-Seidenberg was also revoked at this time. Until 1918, FRIEDLAND in BÖHMEN was part of the Austrian monarchy (Austria side after the compromise of 1867), head of the district with the same name, one of the 94 Bezirkshauptmannschaften in Bohemia. In 1875, a railway line Liberec - Frýdlant - Zawidów was put into operation. Lines to Mirsk (Friedberg) and the Frýdlant–Heřmanice Railway to Zittau followed soon. The new town hall was erected in 1893 according to plans by the Viennese architect Franz Neumann. In 1938, it was occupied by the Nazi army as one of the municipalities in Sudetenland. The German-speaking population was expelled in 1945 (see the Beneš decrees) and replaced by Czech settlers. In the 13th century the castle was held by the Ronovci House. It was first mentioned in 1278, when the Bohemian king Přemysl Otakar II removed the lordship from the Ronovci and gave it to Rulek of Bieberstein. The nowadays building consists of a Gothic castle with a high tower and a Renaissance chateau. 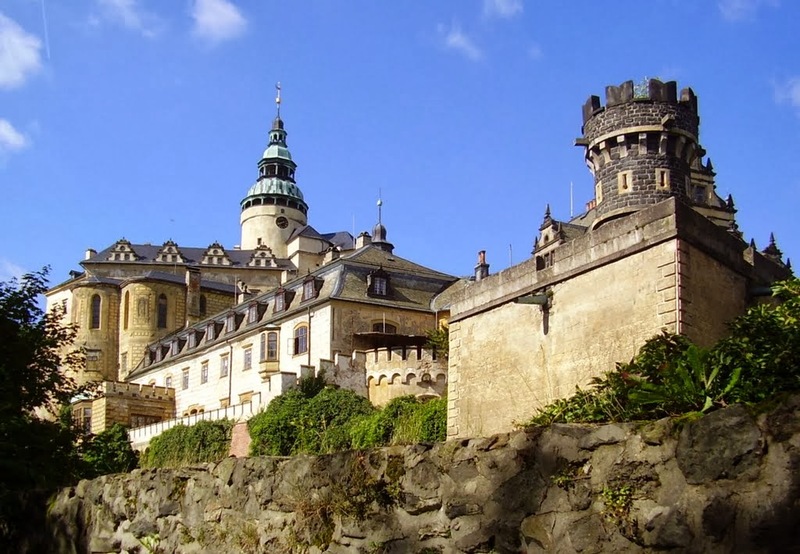 The castle had a museum as early as 1801 and today is one of the most visited in the Czech Republic.